The trailer of Vijay’s upcoming film ‘Theri’ was unveiled by the makers with its audio recently. The 2 minute long trailer showed the Puli actor in three different roles and was packed with action. It got a great response on social media and it has now broken many records. 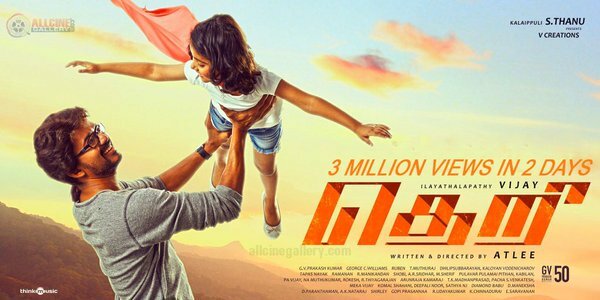 The trailer of the Atlee directorial crossed the 2 million views mark within 24 hours of its release. It is now racing towards the 3 million mark and the like count stands at 167,574. It has got the most likes for a Tamil trailer. It has also become the most viewed trailer in such short period of time. The action entertainer has created another record. The US theatrical rights of the flick were sold to CineGalaxy for a whopping amount of Rs. 3 crore, highest for a Vijay film. Hopefully, the film will create many records after its release as well.